The AFG / GSA PBS Team has been named winner of the 2017 Construction Management Excellence Award by the Construction Management Association of America National Capital Chapter for its efforts on the $16.6M GSA Sidney Yates Federal Building Exterior Restoration Project. We are honored to be recognized for this award two years in a row. The AFG Group, Inc. (AFG)/General Services Administration (GSA) Public Buildings Service (PBS) Team has been named winner of the 2017 Construction Management Excellence Award for Small Firms by the Construction Management Association of America (CMAA) National Capital Chapter (NCC) for its efforts on the $16.6M GSA Sidney Yates Federal Building Exterior Restoration Project. The CM Excellence Category recognizes exemplary contributions to the CM industry over the past year. Considerations for the award include the level of complexity of the project, how creativity was fostered in the execution of the project, and the level of success of the project outcomes. This is the second year for the CM Excellence Category and the second time that the AFG and GSA PBS team has won the award. 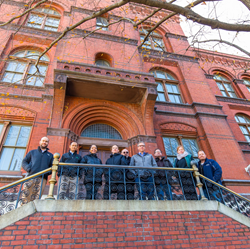 On the winning project, the AFG and GSA PBS team provided CM services, overseeing the restoration of all 6,400 masonry units, all 555 windows, and all stonework, using 19th-century materials and methods to meet historic preservation standards. The Yates Building, constructed in 1879, is located in Washington, DC on the National Mall. The AFG Team included: Kai Goodrich, CCM, CHC, LEED AP, Project Director, Thomas Johnson, Project Manager, Ly Huynh, Construction Manager, Bridget Rogers, Assistant Project Manager, Dajah Massey, Field Engineer, and Joseph Soraghan, Associate. The GSA PBS Team was led by Douglas Selby, Project Manager. AFG Group, Inc. is a woman-owned firm with over 25 years of business acumen, focused on multi-disciplined program, project, construction, and relocation management. For additional information, please visit http://www.afgcm.com.